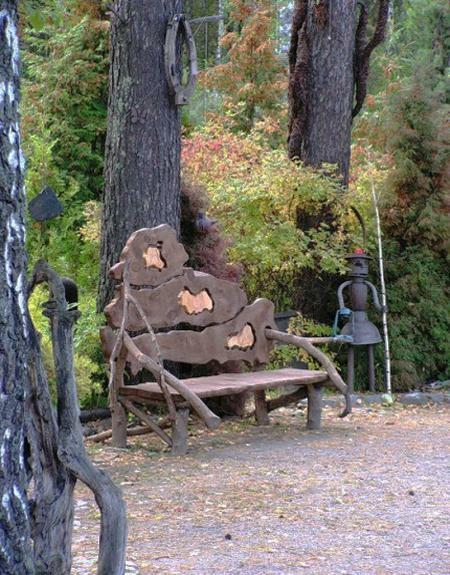 Unique wooden benches can add character to garden and backyard designs, and personalize yard landscaping ideas with interesting shapes or colors. 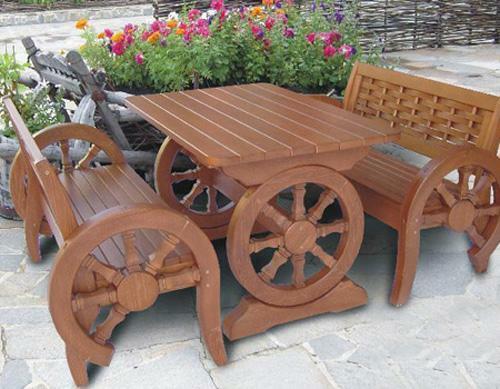 Unusual wooden benches, especially handmade designs create not just functional outdoor furniture pieces, but gorgeous home decorations that families enjoy for years. 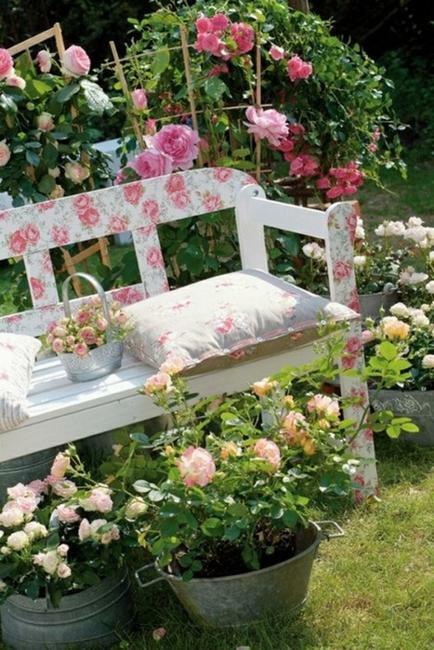 Here is a collection of creative decorating and design ideas to personalize outdoor benches and create one-of-a-kind garden and backyard designs. A wooden bench is simple and comfortable outdoor furniture piece that offer a space where a few people can be outside together. A wooden bench is great for the parents and kids, for relaxation, meditation and socializing or having a picnic with a family. 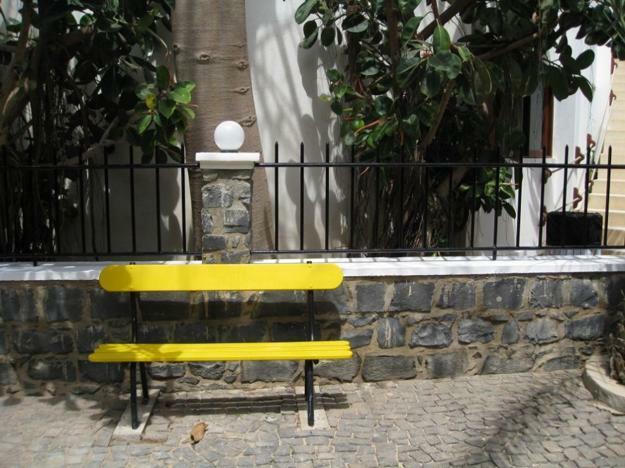 Unique handmade wooden benches look inviting, reflecting their owners taste and lifestyle. 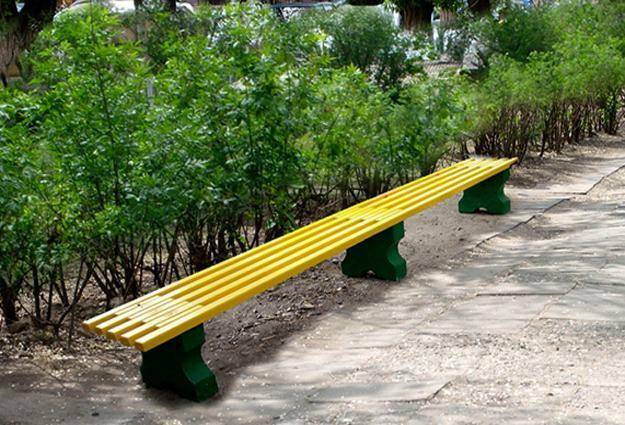 Wooden benches can be made with metal, cement or plastic parts and decorated with intricate carving or colorful paint. Beautiful outdoor benches are a unique way of personalizing your outdoor home decor, blending materials, textures, colors and patterns into gorgeous and original designs for outdoor seating areas. 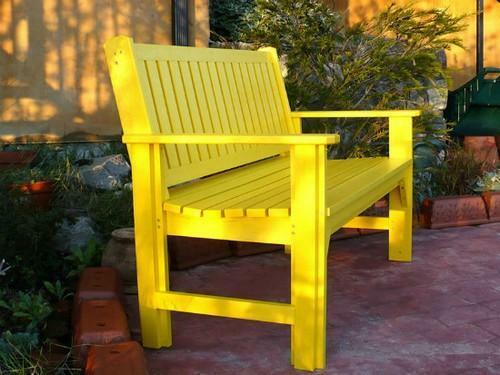 Painting wooden benches or wooden parts of garden benches is one of the most popular ways of outdoor furniture decorating. 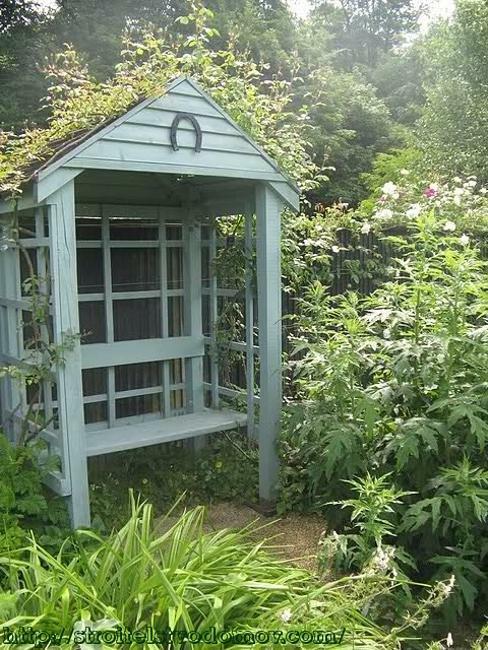 Outdoor paint works well on wood and help add bright or neutral colors to garden designs and backyard landscaping. A few paint colors or interesting decoration patterns turn an ordinary wooden bench into a gorgeous centerpiece. 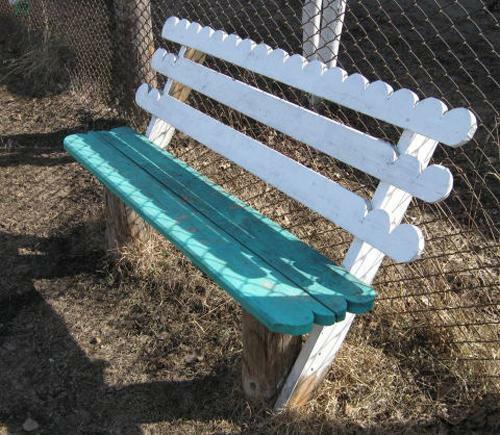 Painting wooden benches is a easy DIY project that is fun for the entire family. Painting your names and your kids names create truly personalized wooden bench design. Kids footprints and hand prints are another decorating design ideas that allow to compare prints every year as your children grow, adding sentimental accents and lots of fun to your yard landscaping and family life. 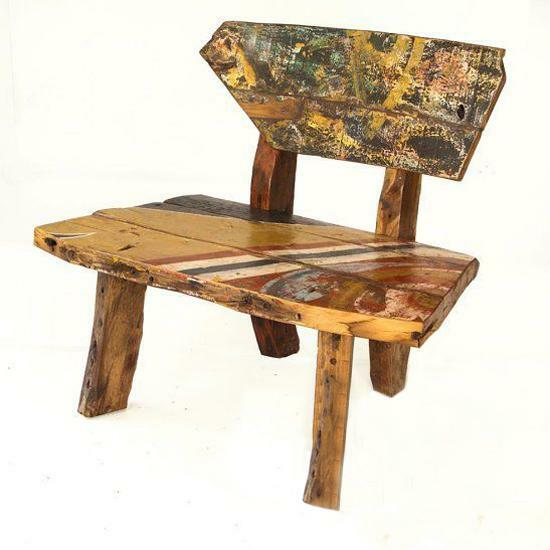 Unusual decoration patterns create simple and impressive decorating designs, personalizing a wooden bench with color contrasts. 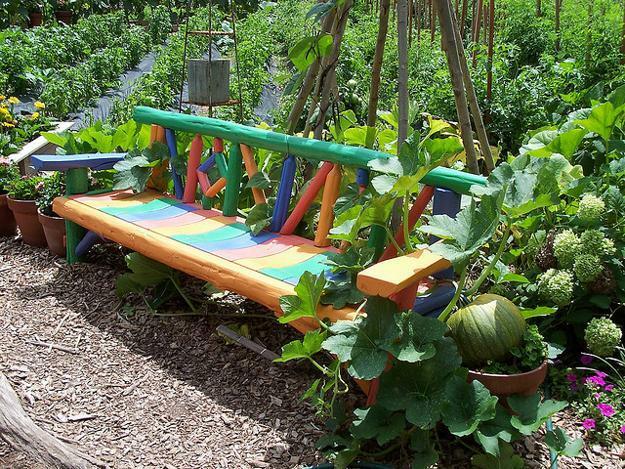 Checkerboard, polka dot or striped decoration patterns, floral and green leaf patterns painted on wooden surfaces add fantastic accents to yard landscaping ideas and personalize your wooden bench with bright colors and creative designs. 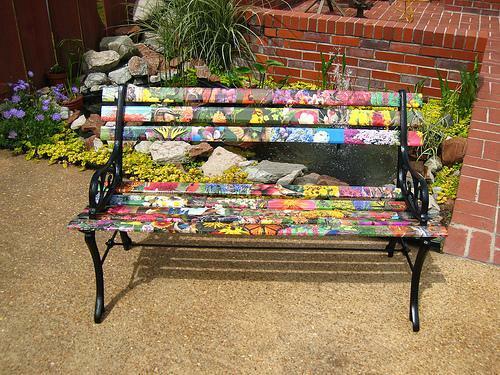 Decorating wooden benches with sea shells and rocks, metal wire and carving, tile pieces or unusually constructed wooden parts and surprising shapes create fun family benches for your garden and backyard design. Various decoration patterns, meaningful words or personal names are just a few creative ideas for wooden benches that will look very personal, unusual and interesting, transforming outdoor living spaces and making a statement. Unique decorating design can be created with a pattern or a material combination, different colors and unusual shapes. 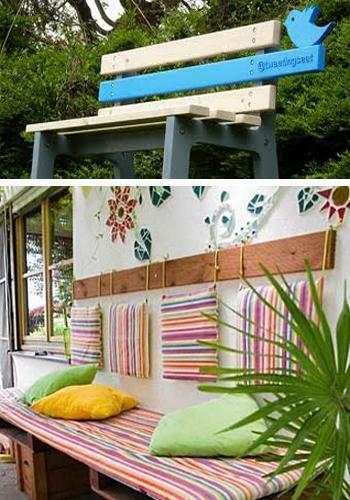 Innovative and inspiring wooden bench decorating ideas are perfect DIY project that create unique outdoor furniture pieces and add personality to your garden and backyard designs. 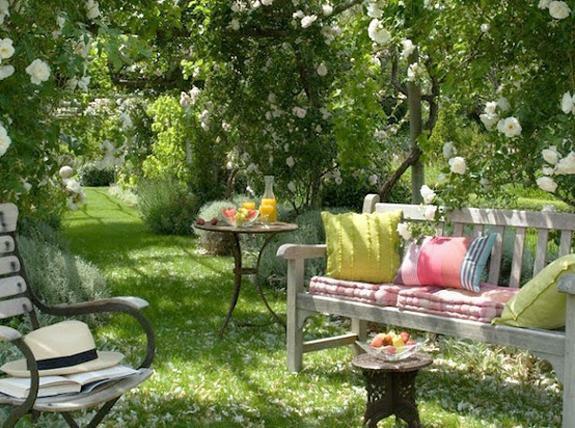 Handmade garden benches and painted wood furniture look fabulous, exclusive and luxurious, creating striking centerpieces for outdoor home decor.